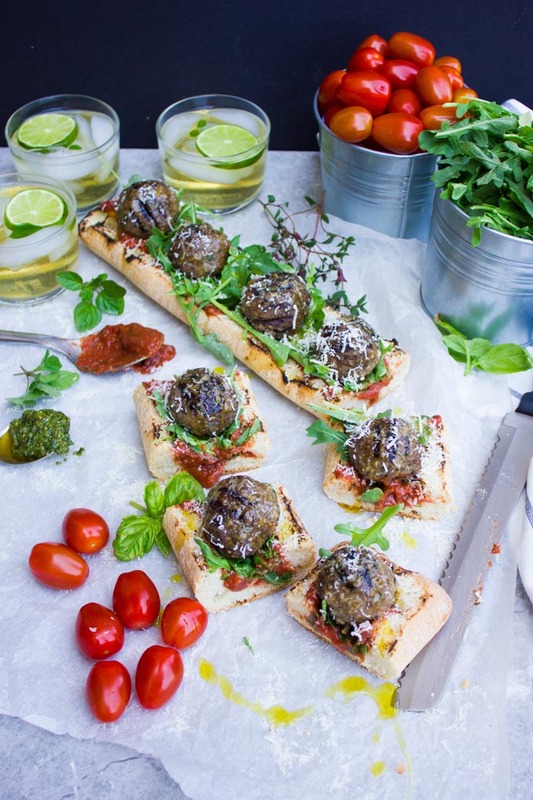 Succulent, flavorful lamb meatball subs with juicy meatballs grilled to perfection, served over fresh no-cook marinara sauce and char-grilled bread. 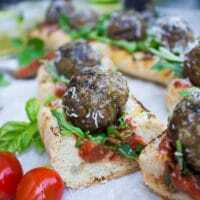 I’m honored to bring you this delicious lamb meatball subs recipe in partnership with the American Lamb Board. Your go-to resource for all the goodness American lamb has to offer! All opinions and thoughts are my own. It’s almost time for Memorial Day!! What are you all grilling this year? We’re all for lamb every year, and if you haven’t tried lamb for Memorial Day yet, I know I can probably change your mind! While I love grilling all summer long, and I love all sorts of meats, veggies, and pizza on the grill. I have to say however that lamb is something else. It’s like the King of the BBQ!! The minute you try it, you’ll be hooked! 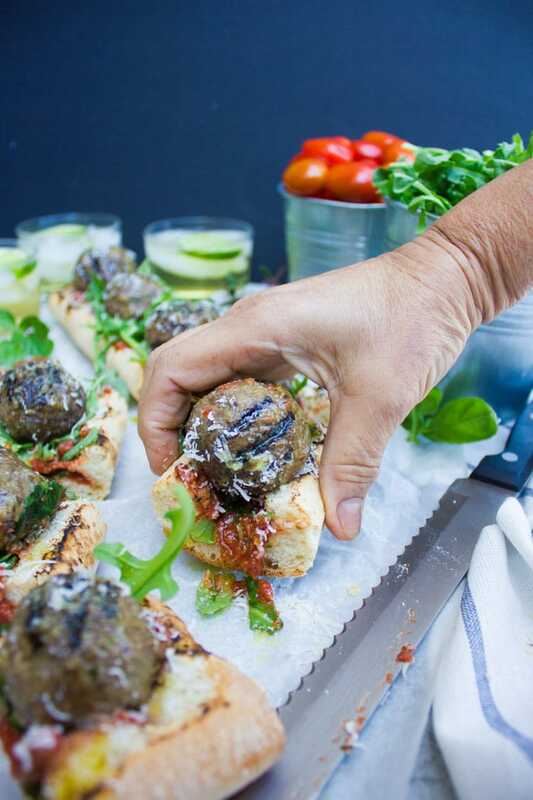 These American Lamb Meatball Subs on the Grill are divine! 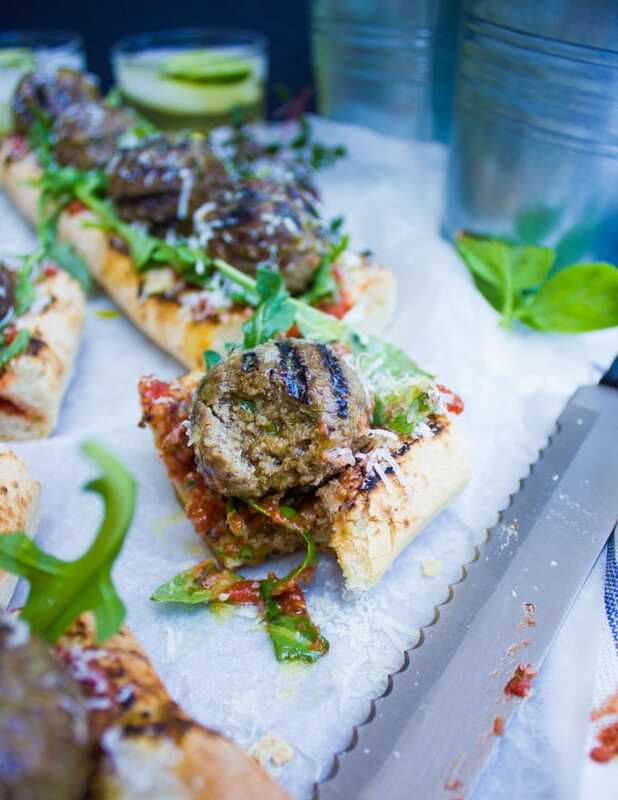 Succulent, flavorful lamb meatballs over fresh no-cook marinara sauce and crispy ciabatta bread fresh from the grill. Top that with some basil pesto and sprinkle with Parmesan cheese and you’re in for a party! This family favorite recipe with an Italian flare is on the menu for Memorial Day! Before we get into these yummy meatball subs, I need to mention a few things about my beloved lamb! First of all, the quality of lamb you buy makes a world of difference to the final taste and texture of your lamb dish. So if I had to stress on one point the most, it would be to make sure you’re buying American Lamb. It’s homegrown with love and grown to the highest quality standards there is. So you’re not just supporting local farmers when buying American lamb, you’re actually getting the best, freshest, tastiest and most tender lamb out there! Now let’s talk some lamb meatball subs. What are some of your Memorial Day BBQ stories? I think my favorite memory is from a couple years ago when I moved into my new neighborhood. A few weeks before Memorial Day, we got an invitation to join the street and a few neighboring streets for a BBQ Potluck. The BBQ was happening at the biggest home in the neighborhood, and it was a friendly get together for all the neighbors. 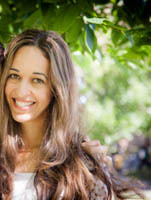 While I had met most of my neighbors at the time through the kids and school bus, I was so excited to get to know everyone. And a bit nervous. Since it was a potluck, I felt a nice big plate of salad would be best. So I made some Coleslaw with Kale Apple Pomegranate , put the kids in their swimming suits and went away. Everyone was so nice and welcoming, the girls had a blast and we ate so much!! Plenty of burgers and hotdogs! You probably can imagine that I talked so much about food. I mentioned trying lamb on the grill. In all honesty, the thought of grilling lamb was certainly new to many of them. So I promised the year after to bring lamb so they can all try it. Throughout the year we became closer and closer and similarly had a few potlucks here and there. But, I realized that the Memorial Day lamb is something everyone was expecting. Finally the next Memorial Day (last year), I made the mix for the Ultimate Lamb kabab Platter with Perfect Tahini Sauce and my Speedy Quinoa Tabouleh With Tahini Dressing. I won’t deny that while the lamb was the awaited star of the BBQ, there were still some burgers and hotdogs. However, after that first bite of a lamb kebab wrap with tahini and tabouleh salad. Everyone asked for MORE lamb!! 🙂 YES! It’s really that flavorful! This year, as you may have guessed, I’m making these Lamb meatballs subs on the grill for my neighborhood! 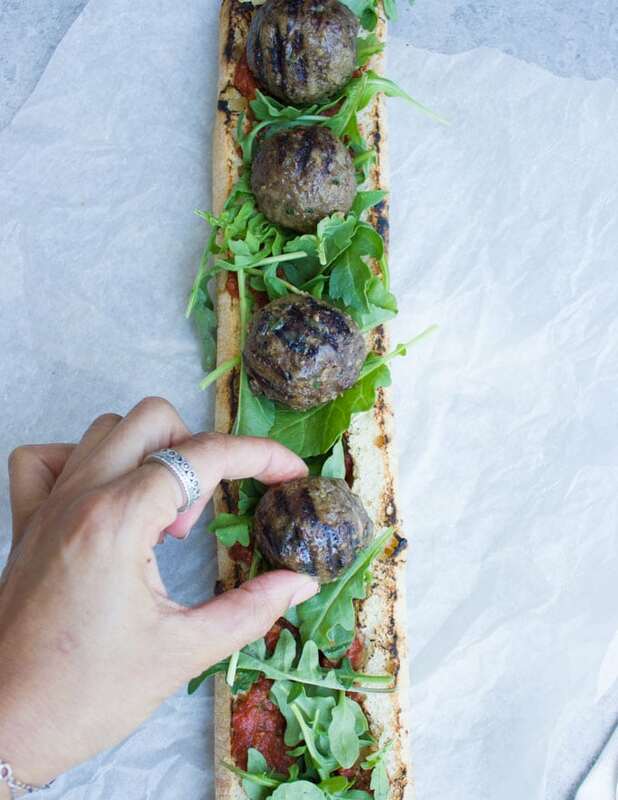 I can’t wait for everyone to try these lamb meatball subs and seriously, can NOT wait for you to make them too!! Let’s start with the bread. Choose your favorite loaf. Pick crunchy if that’s your thing or soft if it’s your preference. 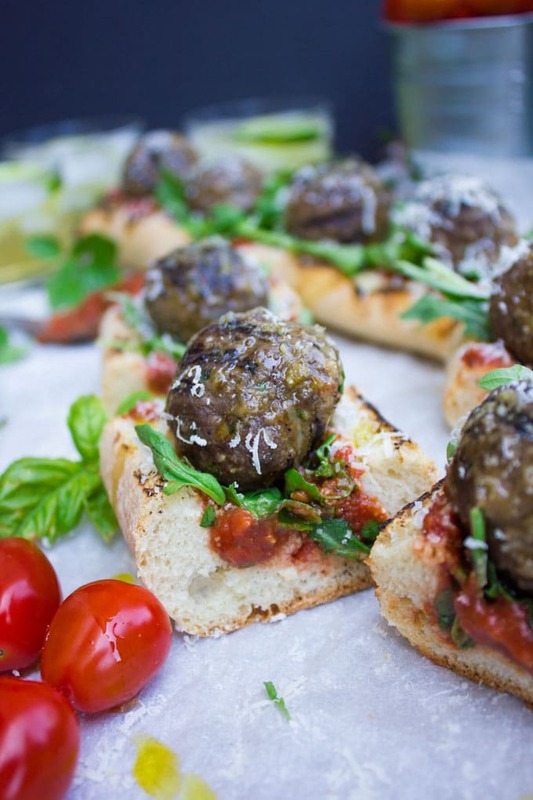 Today I chose a crunchy ciabatta baguette to contrast the soft succulent lamb meatballs. Now for the meatball sub sauce. If you’ve made my Easy No Cook Pizza Sauce, you’re probably familiar with this concept. I LOVE no-cook marinara sauces for the summer! Your homemade marinara sauce is made in the microwave and will taste like fresh, bright tomatoes with a load of garlic and basil! Also, you can buy some basil pesto for the sauce or make your own since it’s basil in the garden season. I’ve got this Protein Packed Nut Free Hemp basil Pesto, which I’ve made without nuts, but feel free to use pine nuts for the hemp seeds. Ok, let’s talk about the lamb meatballs. It’s what makes these meatball subs what they are. The mix is ground American lamb, basil pesto, parmesan cheese, onions, garlic, and breadcrumbs. Roll these into large size golf ball pieces and place on the grill directly or on a grill topper (depending on the size of your meatballs and BBQ). You’ll need to sear the meatballs on both sides and then cover the BBQ for them to cook through. Give the bread some char on the BBQ. Add all the marinara sauce ingredients in a bowl and microwave it for a few minutes. Cut the bread tops and make a cut along the length of the bread. Use your hands to create a boat-like effect on the baguette. 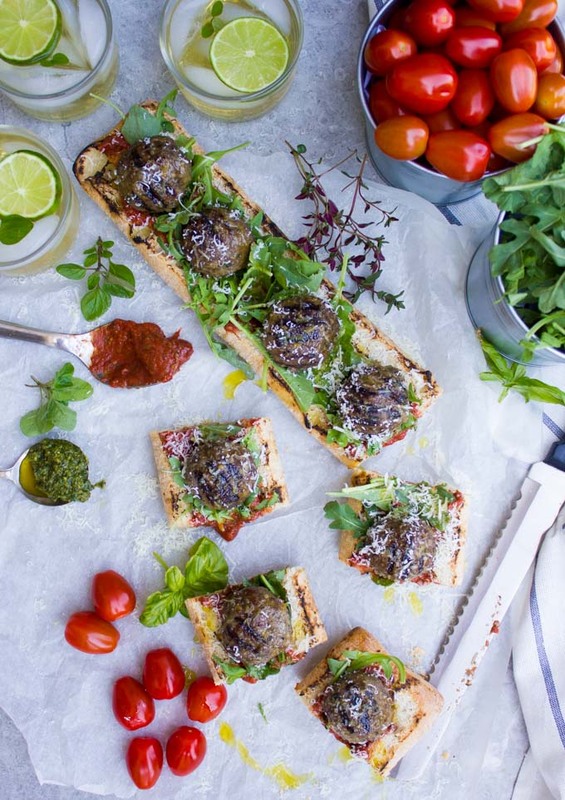 Top the bread with marinara sauce, some basil pesto, some fresh arugula, the lamb meatballs and a hefty sprinkle of parmesan cheese! Feel free to add in some chili flakes, sliced onions, mozzarella sauce..etc. 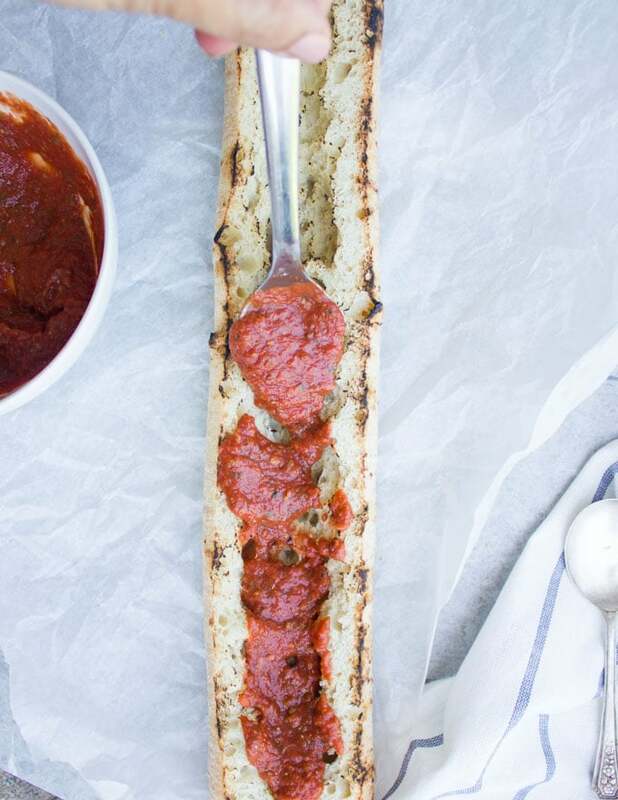 Trust me, these Lamb Meatball Subs are so.darn.delicious! 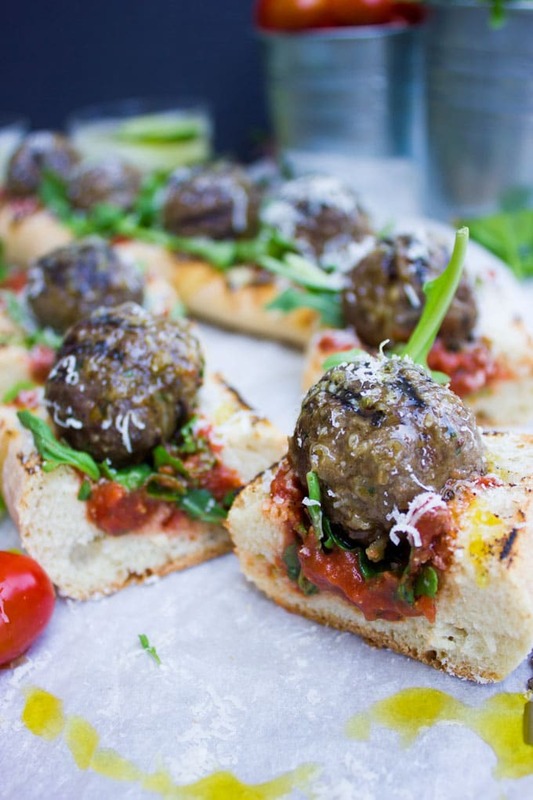 Try this fabulous twist on your favorite meatball sub by switching it to lamb on the BBQ! Check these Grilled Lamb Chops with Black Olive Herb Butter if you’re in the mood for a meatier cut on the grill. You can buy some basil pesto for the sauce or make your own. I recommend this recipe for Protein Packed Nut Free Hemp basil Pesto. This grilled meatball subs recipe works just as well with regular ground beef ( very lean ground beef might by to dry). Happy everything on the grilling season!! 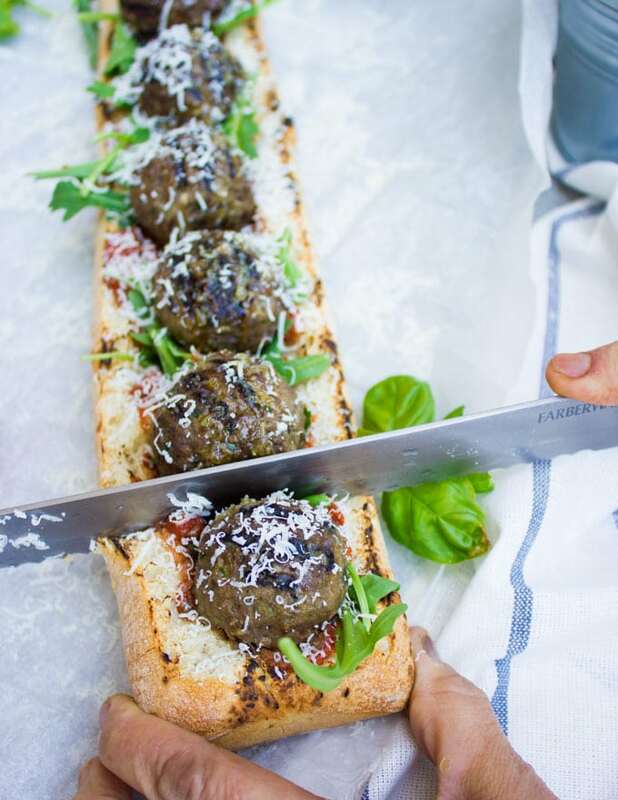 These American Lamb Meatball Subs on the Grill are the beginning of many delicious goodies coming your way! Succulent, flavorful lamb meatballs grilled to perfection, served over fresh no-cook marinara sauce and char-grilled bread. Top that with some basil pesto and a good load of freshly grated Parmesan cheese and you’re in for a party! This family favorite recipe with an Italian flare is on the menu for Memorial Day! Preheat your BBQ to a medium high setting. Make the lamb meatballs. In a food processor, puree all ingredients except for the lamb. Add this pureed mixture to the lamb and mix to combine. Divide the lamb into golf size pieces and roll into a meatball shape. Repeat with the remaining mixture. Grill the meatballs directly on your BBQ crates or on a BBQ sheet pan for 2 mins on each side. Lower the heat to medium and cover your BBQ, then allow the meatballs to cook through— about 5-8 mins depending on the size of your meatballs. In the meantime, make the marinara sauce. Mix all ingredients in a microwave safe bowl and microwave on high for 4 minutes until bubbly. Taste and adjust seasoning. To assemble the meatball subs, take the loaf of bread and cut the top off. Use a knife to cut the bread along the length but not all the way through so you create a hole for the meatballs to sink in. Grill the bread if you like for just 1 minute per side. Spread the marinara sauce over the bread, drizzle some extra basil pesto if you’d like and scatter some fresh arugula or spinach leaves over that. 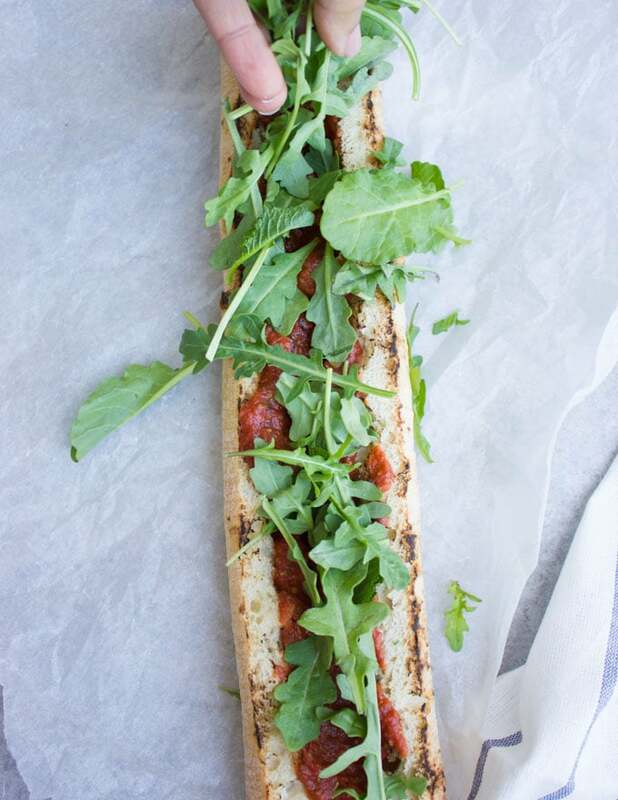 Arrange the meatballs on top of the arugula pressing them down so they stick to the marinara sauce and sink deeply into the bread. Grate some fresh parmesan cheese over the meatballs and sprinkle some chili flakes if you’d like. 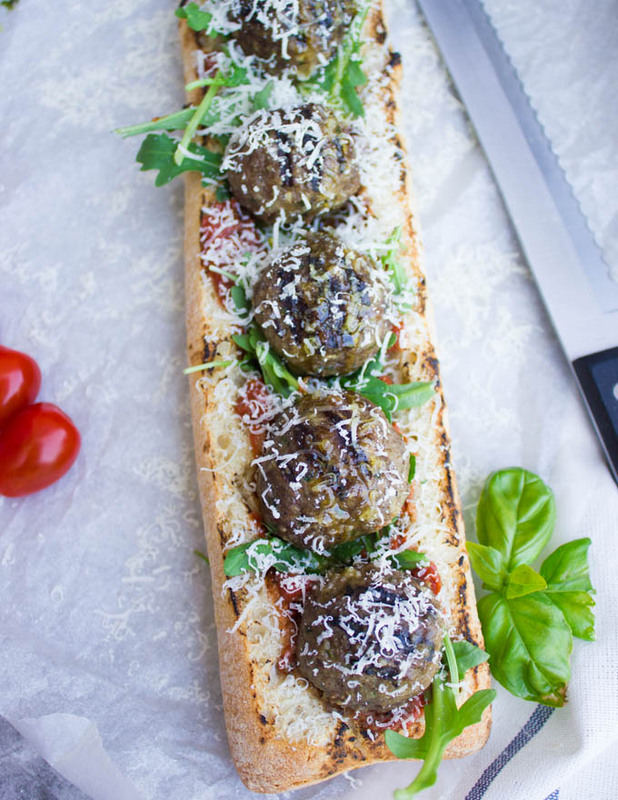 Use a serrated knife and cut up the large baguette into pieces with a single meatball over them. 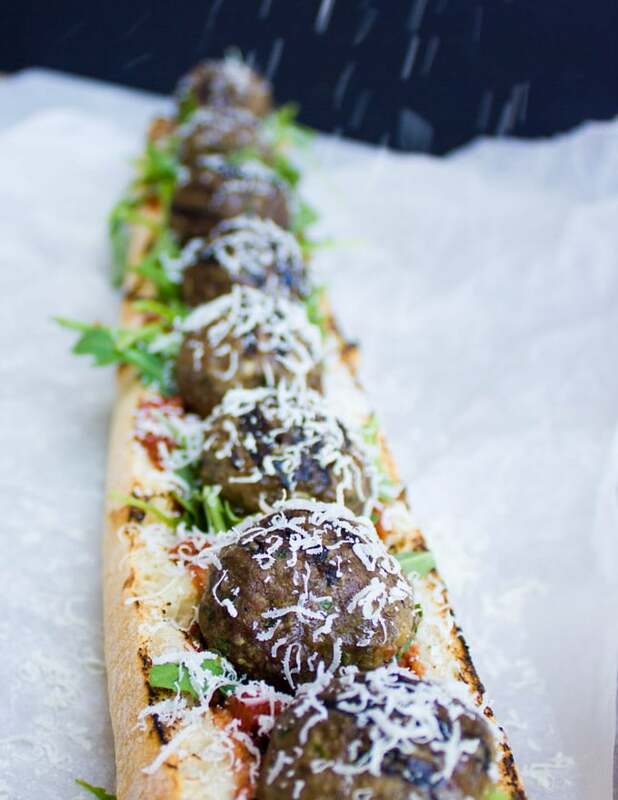 I love the idea of putting those meet balls in baguette .I normally eat beef meet balls but those made of lambasted wonderfully .it s So practical also this way . hahaha Thanks Isadora!! Hope you make them soon! you’ll enjoy them! !